*All photos by Aiste Miseviciute of Luxeat. Check out her blog for many beautiful photos of her meals in Japan. 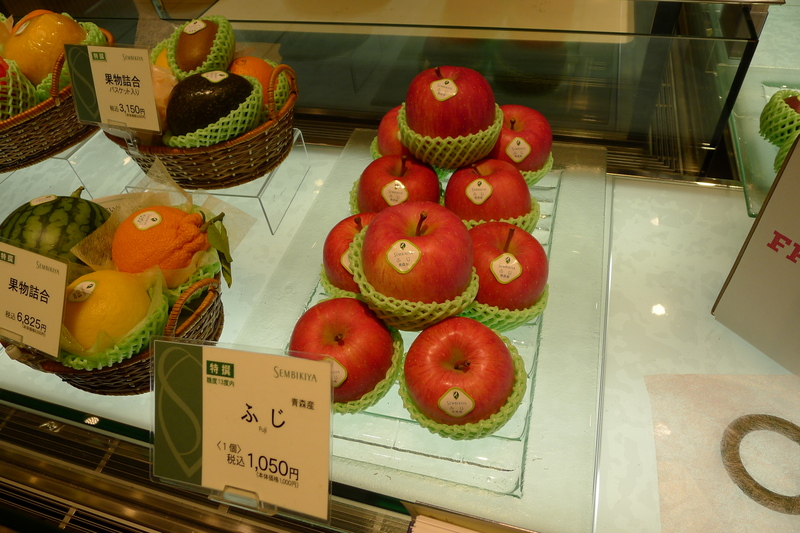 A visit to Japan for any foodie would not be complete without a careful peruse of the upscale fruit shops. My personal favorite is Nihonbashi Sembikiya, which is Japan’s oldest fruit shop. Sembikiya originated in 1834 in Koshigaya, north of Tokyo. It was started by a samurai and moved to the mercantile district of Nihonbashi in 1867. Japan’s first fruit restaurant, selling then opened in 1887. The restaurant was the forerunner to the modern day fruit parlor. It is at the fruit parlors where customers can sit and enjoy freshly squeezed fruit juices and sliced fruits as well as parfaits. 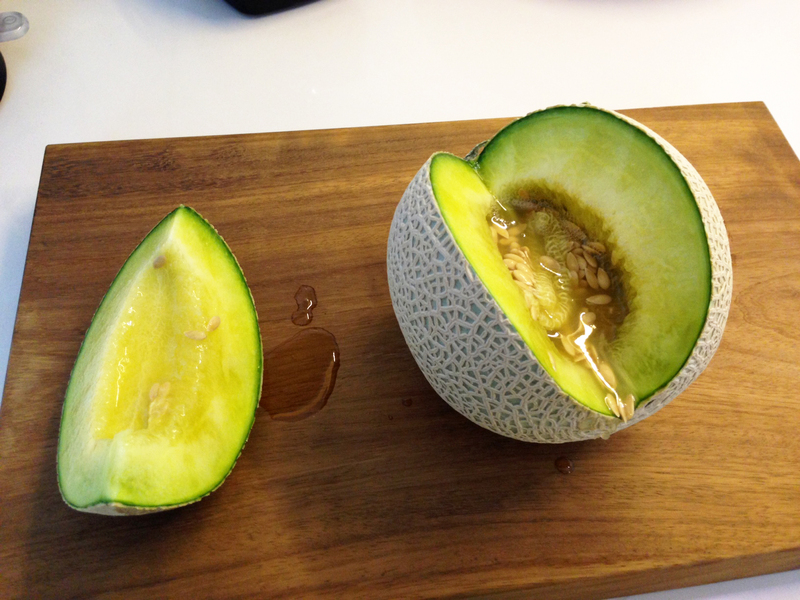 Perhaps the most famous of Japanese fruit is the muskmelon. Here it is wrapped up. Yes, in a wooden box and cradled with packaging to prevent it from bruising. 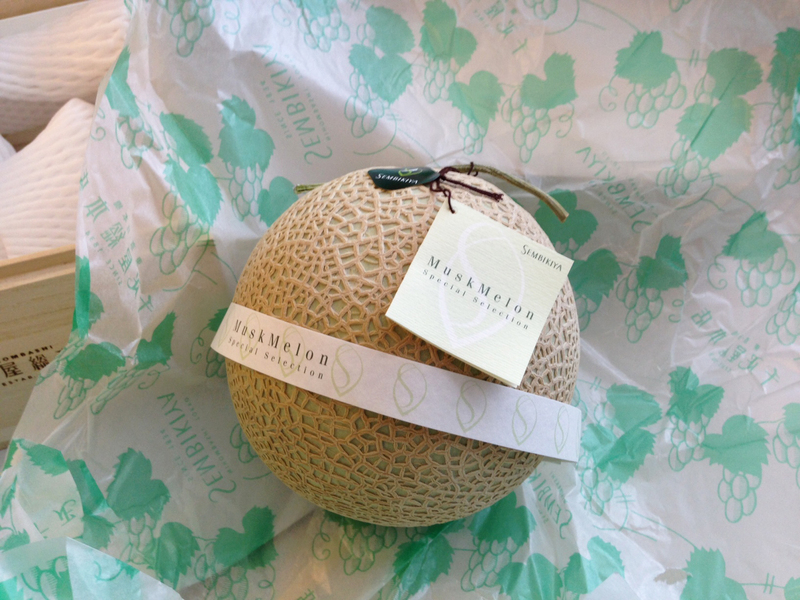 The muskmelon from Sembikiya all come from Shizuoka prefecture. Shizuoka was selected as it gets a lot of sunshine. In the summertime the melons are kept cool with air-conditioning; in the wintertime, kept warm with heaters. And, on each plant only one melon is left to grow while all of the others are cut off. This is so that all of the water and sunlight will be used to nurture the one melon. And, here are the results. A juicy, sweet muskmelon that melts in your mouth. When purchasing one of these gift melons the store clerk will ask you on which day it will be eaten. They then select one in your price range that will be at its peak time for consumption on that day. This melon was purchased five days before it was going to be eaten. It cost about 12,000 JPY (or about $120 USD at current exchange rates). Aiste, of Luxeat, who purchased this was advised to keep the melon out at room temperature until she was ready to eat it. Then, to put it in the fridge about two hours before to cool it down. 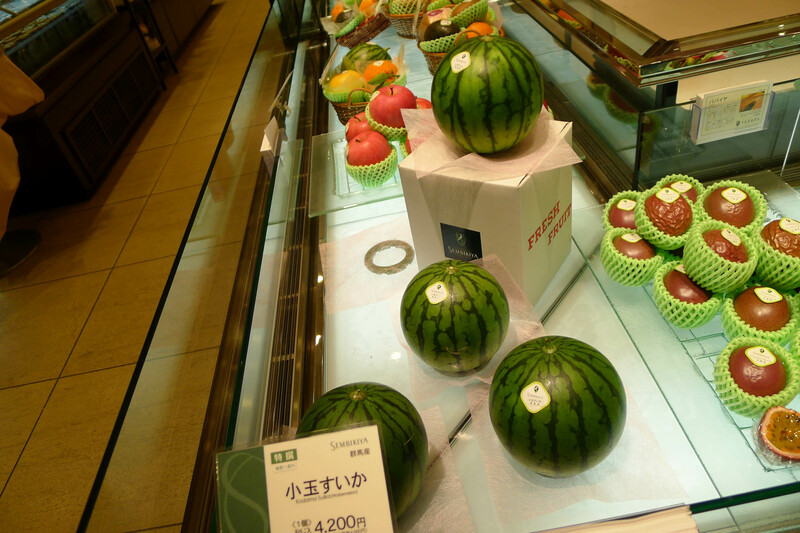 If you will be visiting Tokyo the best way to try a slice of one of these melons is to visit a fruit parlor. Nihonbashi Sembikiya has a café on the first floor next to the fruit shop, Caffe di FESTA, for purchasing freshly squeezed juices and fruit shakes. The second floor is a proper restaurant where sliced fruits, parfaits, and curries made with fruit are served. Depachika, the epicurean food halls in the basement of department stores, also have eat-in counters where customers can indulge in sliced fruits, freshly squeezed juices, and other fruit-based sweets. Here is a list of my favorite depachika in Tokyo. 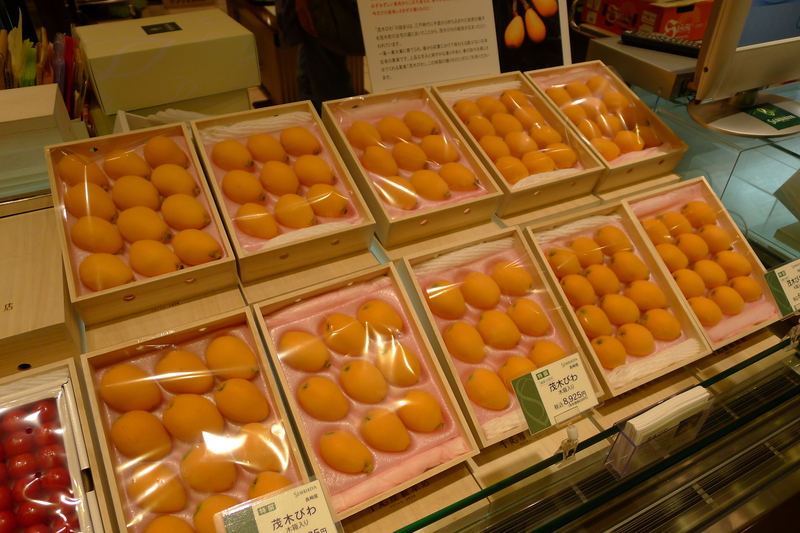 In this photo are Nagasaki biwa (loquats, Eriobotrya japonica), in season in the spring. These tangy and sweet fruit can be eaten fresh or simmered in a simple syrup. It is also lovely in a gelatin. 8,925 JPY per box. The apple season is just ending its season in Japan. These red Fuji apples come from Aomori prefecture in the north of Japan. Aiste bought some apples and the store clerk had advised her that the peak “shun” or best time for eating apples had passed and that these apples were not as sweet as they are in January or February. She bought one and gave it to me and I have to agree with the store clerk. It was not as juicy or sweet as they can be. 1,050 JPY per apple. Miyazaki, on the southern island of Kyushu, reminds me of Hawaii. Arriving at the airport one is greeted with palm trees and a coastal breeze. 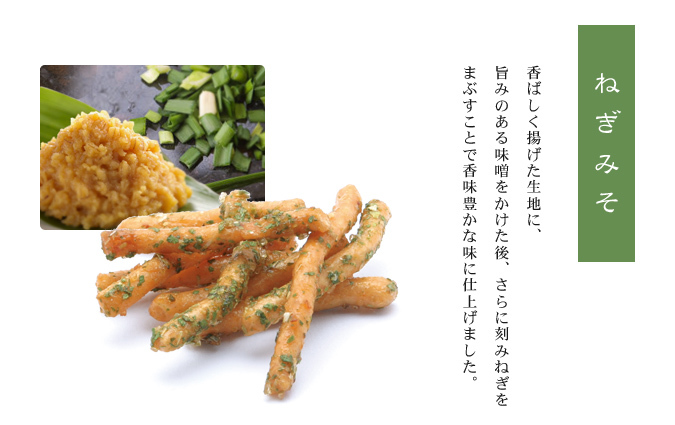 Miyazaki is known for many food and beverages such as shōchū, jidori (local chicken), and mangoes. These juicy fruit bombs can be super sweet and very tender. 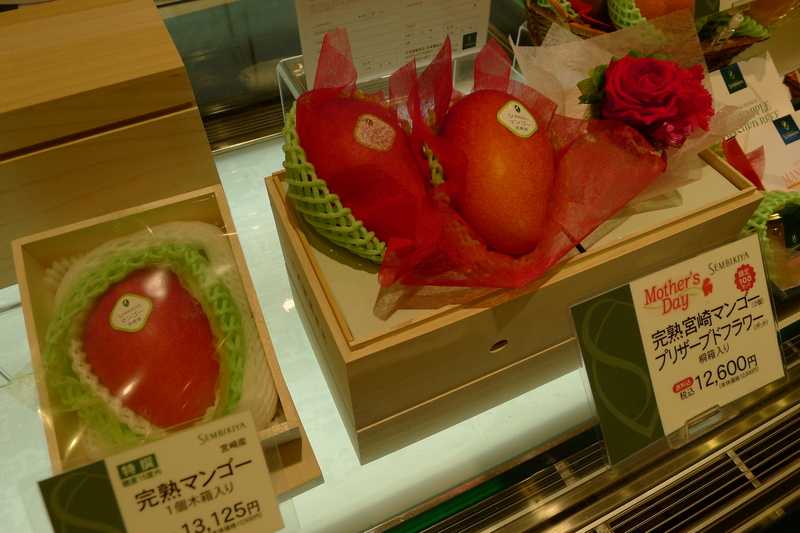 One Miyazaki mango can go for as much as 20,000 JPY. As you can see, the high-end fruit come in wooden boxes and are cradled with packaging to prevent it from bruising. 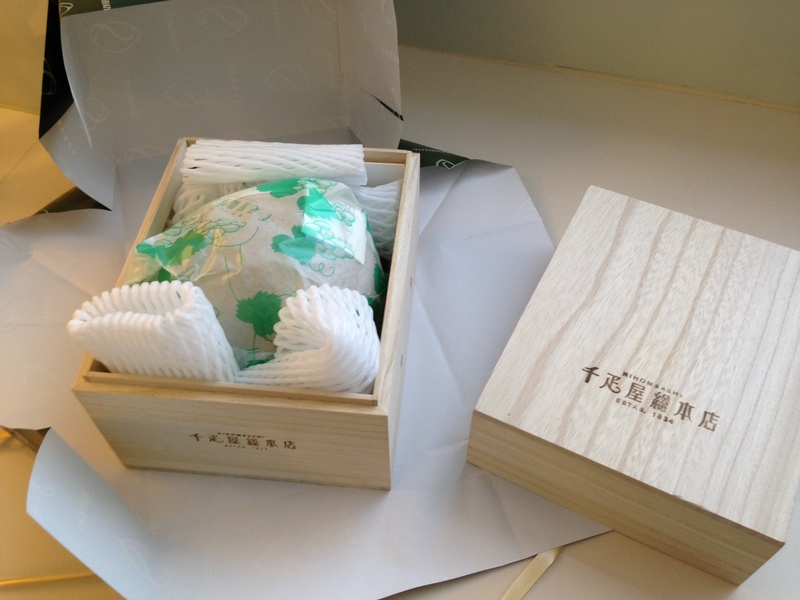 The package on the right with two mangoes and flowers are being promoted as a special gift for Mother’s Day. 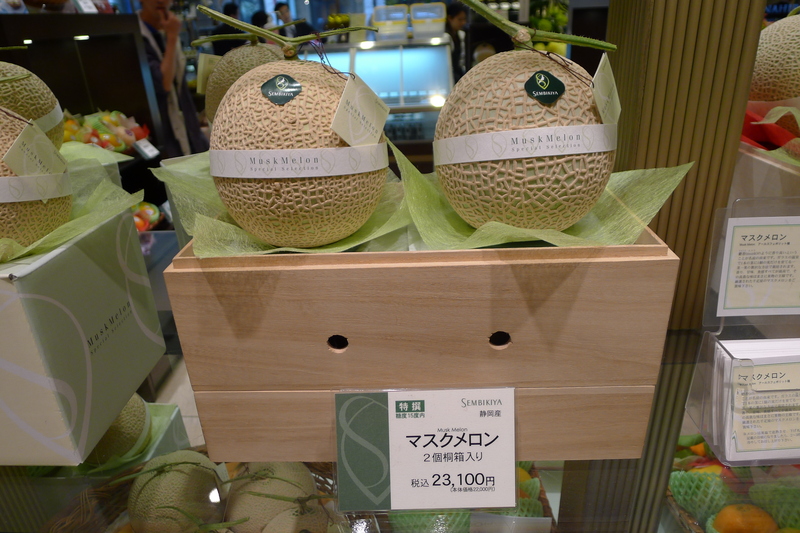 Here are two Shizuoka muskmelon for 23,100 JPY presented in a wooden box. Suika (watermelon) are just now coming into season in Japan. These Kodama suika from Gunma prefecture are perfectly round and go for 4,200 JPY. The most impressive display of fresh fruit are these wooden boxes of sakurarnbo cherries from Yamagata prefecture. 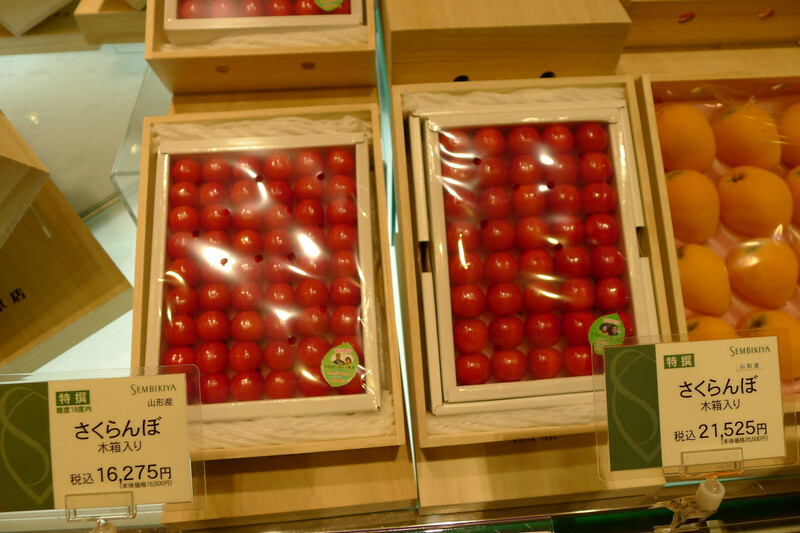 The box on the right has 40 cherries all of the same size that are lined up in perfect rows for an astonishing 21,525 JPY (over $200 USD). That is about $5 USD per cherry. On the depachika food tours we do for Food Sake Tokyo we visit a fruit shop in a department store basement. Clients are always surprised at the exorbitant price of the fruit in these shops. Of course, this is not where we go to buy fruit to eat at home. Fruit purchased here is part of the rich gift-giving culture in Japan. As Mother’s Day is coming up there are many signs at Sembikiya suggesting giving fruit to your mother as a gift. Fruit are also popular as gifts for elderly friends or if someone is in the hospital. Be sure to visit a fruit shop when you are in Japan. Indulge in a slice of muskmelon or some freshly squeezed fruit juice at the fruit parlor. Omiyage most often describes gifts that you pick up while traveling that you bring back to your family, friends, and colleagues. For example, on a trip to Kyoto I may select some local jizake or wagashi for friends. For my colleagues at work I may pick up a box of yatsuhashi, a popular confectionary that Kyoto is known for. It is important when selecting gifts that they are purchased at the correct price. You don’t want to give a gift that is too expensive or the recipient may feel the need to reciprocate, often referred to as okaeshi. I learned about this while working at Takashimaya. 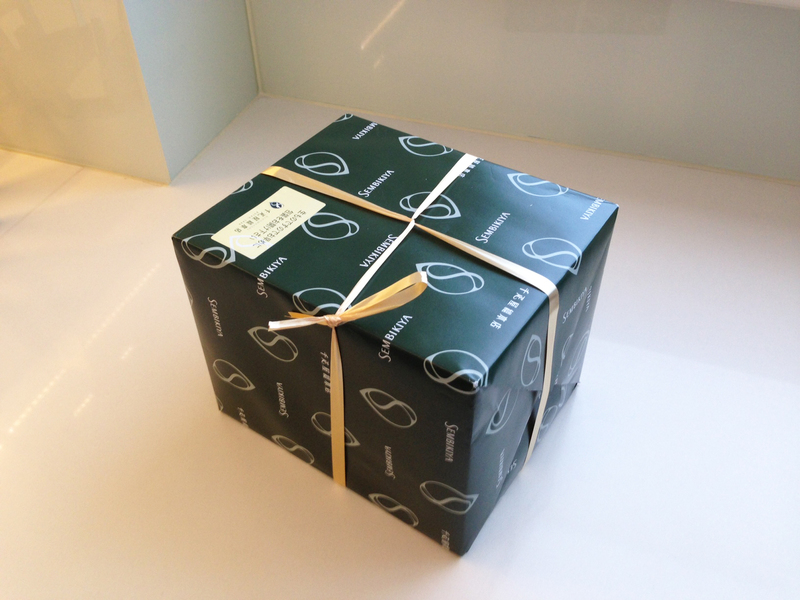 The occasion determines not only how much would be spent on a gift, but also how it may be wrapped. If you need to send a gift to someone bring along their address and phone number. Most shops will arrange for a delivery service, many times for next-day delivery. The gift-giving ritual in Japan is for another blog post, so for now, just my tips on what to look for and some suggestions for some of my favorite gifts from Tokyo. And as we enter the holidays, if you are invited to a friend’s home, consider bringing along one of the items listed below as a show of your appreciation. Tips – look for gentei or limited production items. Shun or kisetsu are used to describe seasonal items. Alternatively, koko de shika meaning that the produce is sold only there or ima shika – that it is only being sold for a limited period. Some popular omiyage at the moment include Baumkuchen, sweets in the form of a small sandwich, or rusks which are toasts, usually sweetened with sugar and maybe some butter. Here are my favorite gifts from Tokyo. Tokyo has a surprising number of sake kura (breweries) and this always makes for a nice gift for anyone who appreciates nihonshu. 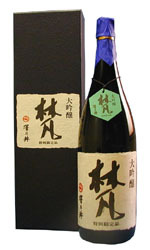 My personal favorite Tokyo sake is Sawa no I from Ome in Okutama (Western Tokyo in the mountains). On a personal note, I love this sake so much we served it at our wedding. Sake can be purchased at the sake department in depachika. Alternatively, Hasegawa Saketen is a wonderful sake shop with a few branches in the city. Japanese knives are the perfect gift for anyone who loves to cook. Here is my list of knife shops in Tokyo. Karintou from Nishiki Hourin. These sweet crackers come in flavors like shichimi tougarashi (seven spice), negi miso (leek and miso), kinpira gobo (burdock root and carrot), and kuro koshou (black pepper). The shop is in Tokyo station’s basement in an area called GranSta. It’s easy to find as there is usually a long line. The karintou are sold in small packs so it is fun to pick up a few different flavors. This is an example of koko shika as the karintou can only be bought here – nowhere else in the world. Yoku Moku is a Japanese confectionary shop specializing in Western confectionaries. In particular, I love their cigares which are sold in pastel tins. 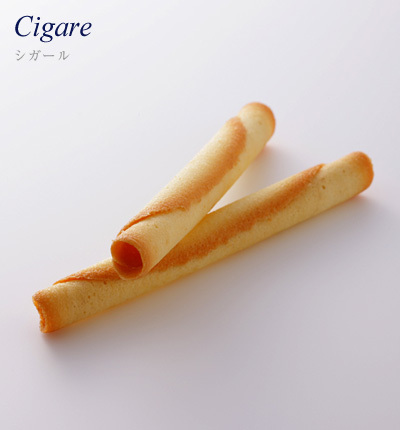 Think delicately thin butter cookies rolled into a cigare. I often bring this as an omiyage as a hostess gift. Yoku Moku can be found in almost every depachika. 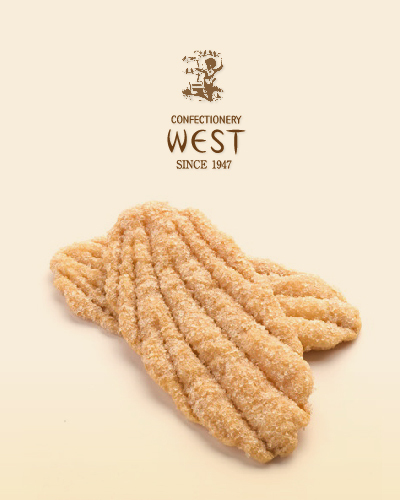 Leaf Pie from Confectionary West are another popular Western style cookie that is rich with butter and sugar. The main branch is in Ginza but most depachika also sell these addictive cookies. For some savory osembei (rice crackers) look no further than the shiokaki from Mamegen in Azabu Juban. I usually buy these as omiyage for myself. Like Doritos or whatever chips you are addicted to, you can’t stop once you start. Mamegen is known for their flavored nuts and beans in fun flavors like wasabi, mattcha, or uni. Mamegen also can be found in most depachika. For traditional wagashi (Japanese confectionaries) I always find myself going to Suzukake in Shinjuku Isetan. I am a sucker for its simple packaging and no matter what you get, it is always delicious. In particular, ask for the seasonal nama wagashi. For more modern wagashi, check out the mattcha babaloa from Kinozen in Kagurazaka or the confectionaries at Higashiya Ginza. 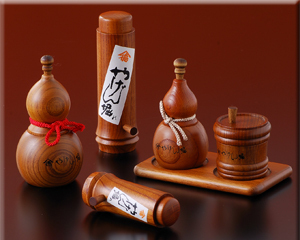 For a special gift, create your own shichimi (seven spice) from Yagenbori in Asakusa (Asakusa 1-28-3). The shop sells its own recommended version, but you can develop your own flavor on the spot. Be sure to pick up a wooden dispenser while there (see photo above). Finally, for a real treat, select some seasonal fresh fruit from Sembikiya or Lemon or Takano. Melon is perhaps the most famous food gift, notably for its price which can be a few hundred dollars for one. But there are a variety of fruit that changes throughout the season and at a variety of prices. My cousin is a big fan of the fruit jellies which are packaged in the shell of the fruit. Got a question about my favorite nori shop in Tsukiji Market. It is Maruyama and their information is listed below in the comments section. Perhaps the most popular food gift at the moment from Tokyo Station for visitors to Japan is the regional flavored Kit Kats. I list the shop in this Metropolis article.